The 4 Key Questions students should ask on every ACT Math problem. Every question on the Math section of the ACT should be approached in the same way. Consider yourself a detective, searching for clues within a problem to solve the question that the ACT is asking. I know what you’re probably thinking – if I have to walk through each of these 4 questions for every problem, I’ll never finish the test! After practice and repetition, these questions will quickly guide you and actually save you time as you approach each question with a plan. Identify what the question is asking you to solve for. Word Problem!? Underline the last sentence to ensure that you are answering the write question and to really focus your attention and optimize your time. Geometry problem? Mark the section on the figure that you need to really evaluate. This answer comes from two sources: 1) What can I learn from the question itself and 2) what do I remember from what I have studied? Are there formulas or equations that I can use to help me set up and solve the problem? Some problems will use one of these, but the more advance will start to pull in information what you know and what you have in front of you in the question. The next step is to figure out how these things work together. How can you best make use of all of the information you have to answer the question? Make notes and write down what you know from question 2. 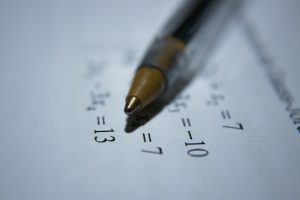 For Algebra problems, write down content and information (don’t feel that you have to do all of the work in your head). For geometry problems, draw figures from the problem, and label them with the content provided in the problem. Try to use each of the pieces of information that you have and determine how they work together to help you best solve the problem. Be sure to carefully evaluate your answer to ensure that you are answering the RIGHT question? Remember from #1 above, we underlined the last sentence to help us focus on what we needed to answer. At this point, you need to cross-check your current answer with what they asked you to solve for. If they match, you’re good to go. If not, work to see how you can take your current answer as an input into something else to solve the problem. TIP: Practice these 4 questions on sample problems at your own pace and work on asking for each problem that you do until they become a habit. This habit will ensure you stay focused on answering the right question and moving in an effective and efficient manner to solve the problem being asked.